Calyx four lobed leaves narrowly elliptic. One of the rare edible mangrove fruit. Pickles and Chatni are testy as well as appetizer. The cell turgid pressure is one of the highest in mangrove (120 ATS). The best fodder for the mangrove deer. The Sonneratia creek are the best abode of fish and tiger prawn. The leaves contain high acting growth promoting hormones Tetrahydro GA. Older trees attain high diameter as well as height and often hosts good population of pteridophyte plants such as stenoclaena palustrae. 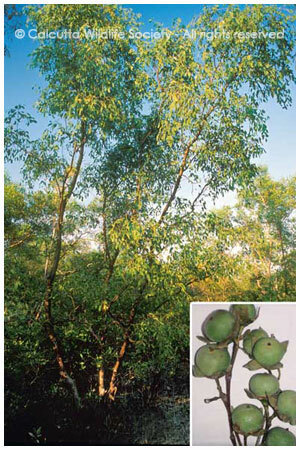 This stenochlaena palustre climber is the only common plant between mangrove and North Bengal flora. Fruit prickle is used for digestion. Fermented fruit juice relieves hemorrhage.